Artwork from this exhibition are still available for sale. A show of political and counter-culture posters in association with JOSEF LEBOVIC. Posters have been a feature of the public landscape since the invention of the printing press but the great revolution in posters came in the late C.18th with lithography invented in 1796, followed by chromolithography, which allowed for mass editions of posters illustrated in vibrant colours to be printed. Political protest, counter-cultural advertising and all kinds of propaganda flourished on walls in layers of information ephemera pasted and over-pasted all intended to be seen, read and then largely forgotten.From early on in C.19th savvy collectors in London and Paris began to harvest the large, colourful and graphically attractive posters designed by known artists, such as JulesChÃ©ret and Henri de Toulouse-Lautrec. Such posters came to be highly prized. So too are many of the posters of C.20th, particularly those of the 1960s and 70s, which flourished with the huge social and cultural protest movements of anti-war, second wave feminism, civil rights and first nations land claims. Some of the best remain icons into C.21st - instantly recognizable and highly collectible. The Australian and International posters selected for this show from the collection of Josef Lebovic provide a chance to reflect again on the way posters captured the issues of the moment - all on paper in an age before Twitter. 79 Earthworks Poster Collective (Aust., active 1971-1980) Second Triennial May Day Palace Revolution Ball, 1977. Colour screenprint, Earthworks logo, studio line and date in image centre right, 74.6 x 49cm. Slight foxing, repainting and repaired tears and creases to corners. Linen-backed. Text continues "Come as your favourite faction. Balmain Town Hall, Sat, April 30, 7-12pm. Sheila. Wasted Daze. Stiletto. Proceeds to Right to Work Campaign and Vietnam Reconstruction. Kids free, $3 usual 'bludgers' discount." 170 Guttersnipes "Darling It Hurts", 1987. Colour screenprint, Guttersnipes copyright line in image upper right, 76.3 x 51cm. Linen-backed. Text continues "A Super 8 Meta-Realist Musical by Toby Zoates. 7 Years in the life of a singer and a suburb, Darlo. Produced with the assistance of the Creative Development Branch of the [Australian Film] Commission. Dedicated to Little Paul 1970-1987. Thanx [sic] Cha. Hand-printed by T.Z. & Nick at Tin Sheds '87." The twenty-six Grade 1 & 2 Students of Braidwood Central School are certainly gave it their best shot as they embarked on a journey of discovery - a discovery of the world around them. With the guidance of Jude Kovacs, a member of BRAG, it was a journey of imaginative minds. Given freedom to think, express themselves and grow, they discovered art as an outlet that cannot be found in other places; art letting them say what they could not put into words. Every child can pick up a pencil, or a brush to produce something on paper. These 7 & 8 year olds discovered the difference between just using the tools to draw what is expected of them by the "adult world” and seeing with their own eyes the world in colours, shapes, sounds and emotions. Their sheer pleasure of discovery is reflected in their translation of what they saw from close to the ground with their clear eyesight and active imaginations. In the brilliance of colours and shapes they show us the creation of their "child" world on paper. For these children, people will never again be stick figures, the landscape will always be a wonder of planes and shapes disappearing over the horizon, and a bowl of fruit, a jug or a vase will trigger a vision of a still life filling all the blank paper. This exhibition celebrates the artistic achievements of these children who show us how imagination is more important than knowledge. As Albert Einstein said, “... knowledge is limited, whereas imagination embraces the entire world". Artist Statement: The artistic ambition for this artwork lies in a portrayal of the state of our environment and how it has been affected by two hundred years of colonial tenure. Through art practice based in the landscape I have discovered a renewed interest in the question of land ownership, defined by possession, or stewardship being a charge committed upon oneself. An artist seeks out the spirit of a landscape to match their own spirit, which gives an excellent opportunity to connect with the environment, thus opening avenues for one to adopt an attitude of kinship with the land. To this end I have travelled to isolated areas, communicated with Indigenous people of the inland river systems of New South Wales and enjoyed the inspiration available in the remnant forests in south eastern Australia. The work I have produced for this program is intended to provoke recognition of the spirituality of the land, through consideration of endangered landscapes and endangered skills. Anu was born in Gujarat, India and moved to England in 1972, having spent a few years in Uganda, East Africa. After her secondary education in Essex, she went onto study BA Fine Art at Lanchester Poly. Coventry. Her Public Art career flourished in the UK through the 1980s and 90s where she pioneered laser cut steel sculpture to great acclaim. A short visit down under in 2006 convinced her that she wanted the next stage of her career to be based in the landscape and light of Australia. After four hectic years here, it is clear she is forging new directions for her famed "cut lines" from her studio in Darley, Victoria. Her recent cut paper, lino and light gauge metal works characteristically brim with energy but on a more intimate scale than previously seen in Anu's works. She manages this transition without losing any of her feel for the cherished qualities of her cultural heritage in its decorative and stylistic use of line, form and pattern, evolved from a close study of the natural world. A unique show of contemporary tattoo inking on paper. 50 years of White's art in a unique survey of her prints from 1960 - 2010. 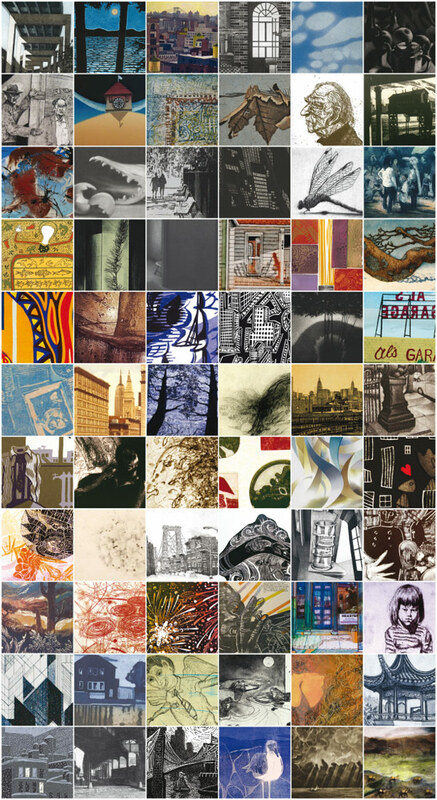 FyreGallery in Braidwood is showing the 77th Members' Exhibition for the Society of American Graphic Artists (SAGA). For the first time works from the renowned American printmakers of SAGA will be on view in Australia. Their thrilling print-making virtuosity has captured the theme 'BRIDGE' to provide the widest possible interpretation of the links between our two great countries. The 66 highly divergent works selected reflect our freedom of expression conveyed in a multitude of ways down time and across cultures. Hall Thorpe (1874 - 1947), the expatriate who lived most of his life in England, determined his woodcuts should be "wholesome in subject, cheerful in colour and decorative in design". His masterpiece, "the Country Bunch", c.1922, is the largest print of his career. Reputed to have taken Thorpe a year to make and using 15 blocks to separate its colours, it is the keystone work of this exhibition. Similarly, "Triptych: Kookaburra, Kangaroo, Koalas", 1940, anchors the works on exhibition by Ethleen Palmer (1906 - 1958). Palmer, whose childhood in the Far East influenced her aesthetic to such an extent that she was described in 1939 as ''...an Australian Hokusai", made Australian flora and fauna her special project. In a generation of astounding Australian women printmakersâ€”think Preston, Spowers, Proctor and Teague, Ethleen Palmer was the undisputed virtuoso of the linocut. Using as many as 12 blocks to complete one print she was unstinting in her efforts to make prints of exceptional vibrancy, depth of colour and decorative appeal. Both Thorpe and Palmer transcend any suggestion of their art being mired in 1920s conservatism through the sheer force of their talent; the phrase 'pretty with an edge' gets closer to the truth. fYREGallery Director, Cheryl Hannah, is delighted to present her 10th show in association with Josef Lebovic Gallery, Sydney. Prints and works on paper by master printmakers Phyllis Sloane, AnaMaria Samaniego and Sandra DuranWilson from New Mexico with new mixed-media works by Suzanne Bellamy from Australia. Dozens of books have been written trying to explain the magic of New Mexico for the artists and art lovers who fall under its desert spell. Words do not do it justice; better to see for yourself the art it inspires. And now you can. FyreGallery is proud to present original works on paper by the doyen of printmaking from the south-west of the USA, PhyBut it is not just the artists who live under New Mexico skies who draw their inspiration from those places. Acclaimed Australian artist Suzanne Bellamy has had a 30 year connection with the valleys and mesas of Taos and Ghost Ranch. She joins Sloane, Samaniego and DuranWilson to show her startling new mixed-media works which embody many of her strong emotional and intellectual responses to those remarkable places.llis Sloane. Her decades of brilliant artmaking are well represented in the prints selected for this show. Her works sit with joyful insouciance alongside the consummate landscape aquatints and etchings of fellow New Mexican printmaker AnaMaria Samaniego. Like Sloane and Samaniego, Sandra DuranWilson is also showing for the first time in Australia. Her intriguing abstract paper compilations draw on her deep interest in science, math and philosophy. DuranWilson references that other important aspect of New Mexico - its historic association with scientific exploration. But it is not just the artists who live under New Mexico skies who draw their inspiration from those places. 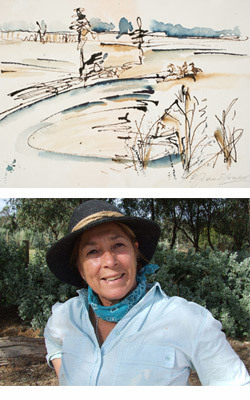 Acclaimed Australian artist Suzanne Bellamy has had a 30 year connection with the valleys and mesas of Taos and Ghost Ranch. She joins Sloane, Samaniego and DuranWilson to show her startling new mixed-media works which embody many of her strong emotional and intellectual responses to those remarkable places. Gallery Director, Cheryl Hannah, is honoured to present her ninth show in fYREGALLERY by four wonderful artists, each with her own commanding vision of amazing New Mexico. Almost thirty years ago Germaine Greer’s ”Obstacle Race” on the fortune of women artists and their work concluded that there are more warring elements in women’s work than men’s and ”when we learn to read them we find that the evidence of battle is interesting and moving.” Three decades on questions about the art of women still perplex and challenge the viewer. FyreGallery’s eigth show WOMAN provides a fascinating opportunity to view a wide range of fine art works on paper by and about some of the most notable women artists of the 20th Century who created masterpieces from the 1800s to the late 1900s in Australia and internationally. Acclaimed Australian regional artist Andrew Townsend is the master of three dimensional works. His body of work stretching back almost three decades has always been grounded in the sense and feel of made objects “re-discovered”. Be they sculptures or works on paper, Andy's intention is always to get beneath the surface of things to explore their intrinsic strangeness and ambiguities. His “worlds” described in collage and drawing, explore various intersecting narratives, contradictions, mixed messages and uncertain endings. They capture the driving force of commerce, a touch of the exotic, the tragedy of change and a lingering nostalgia inherent in found objects perceived in new surroundings. In these exciting new works on paper Andy has created an atmosphere of an old world giving way to a new but he leaves his viewers wondering what world it might be, such is the mystery they evoke. Gallery Director, Cheryl Hannah is very pleased to present World in Worlds for her seventh show in fyreGallery. European artists in the 20th Century often used print making as a way to experiment with new content, make a political statement or extend their personal art making skills. FyreGallery, in association with Josef Lebovic, presents Real+Surreal+Superreal to showcase some of the artists and their images made famous in the early to mid 1900s. Artists include Dali, Delaunay, Hofer, Opfermann, Masereel, Pechstein, Cezanne, Nauen and many others whose work has intrigued, inspired and shocked viewers throughout the 20th Century. Cheryl Hannah, FyreGallery Director, presents this exhibition in association with her long time art advisor and mentor, Josef Lebovic. In this, her sixth exhibition in FyreGallery, Cheryl is pleased to have the opportunity to once again bring high quality international works on paper to a new audience. We speak of weaving a tale, we look for the thread of an idea, we remark on the cut of our cloth. Melbourne weaver, Jenine Davidson is an inspired fabric maker who brings those idioms to life. A graduate of RMIT Universit’s School of Textile Design, Jenine’s weaving has been recognized for its technical virtuosity combined with very strong design elements. She says that what she loves about weaving is bringing order from chaos, although she doesn’t mind if her planning for a piece is overturned by a sudden, serendipitous outcome on the loom. Cheryl Hannah, FyreGallery Director, is pleased to present Jenine’s first solo exhibition. Two years in the making, Jenine’s creative inspiration for the show has been an unusual collaboration with the anonymous weavers of the pieces in Cheryl’s collection of hand woven south-east Asian fabrics. Jenine’s pieces vary in fibre and technique from the original textiles yet they share the same exuberant joy in their making. Jenine’s fibre stories are witty and subtle, telling the art that can be read in the everyday items of life. Their genesis is explained in her delightful little book, "Asia in a Box", which is being launched in conjunction with the exhibition. Picasso's mother, Dona Maria Picasso Lopez, is reputed to have said to Picasso as a small boy, "If you become a soldier, you will be a general. And if you become a monk, you will be pope". Whatever the equivalent is for an artist, Picasso certainly fulfilled his mother's prophecy. Born in 1881, Picasso's life and work towered over the international art community for almost eighty years. Shortly before his death in 1973, at the age of 91, his closest friends and companions noted that he had already passed into myth, so strong was the force of his personality and the influence of his extraordinary artistic genius. These forty works on paper demonstrate Picasso's unique virtuosity as a printmaker. Comprising mainly works selected from his highly acclaimed illustrations of animals and insects for Buffon, Histoire Naturelle, (Paris:Martin Fabiani, watermarked "Vollard" 1936/1942), this exhibition also includes several lithographs from 1963, and two portraits of his children, Claude and Paloma. Cheryl Hannah, fyreGALLERY Director, presents this exhibition in association with her long standing art advisor and mentor, Josef Lebovic. In this, her fourth exhibition in fyreGALLERY, Cheryl is pleased to have the opportunity to bring high quality international works on paper to a new audience. Exciting works by 10 of PNG's leading contemporary artists. See PNG, truly the land of the unexpected, through their eyes. Oscar Towa, Apa Hugo, John Bom, Winston Kaugae, Joe Mek, Chris Kaugae, James Kera, John Danger, Martin Morububuma, Tom Deko. Cheryl Hannah, fYREGALLERY Director is pleased to present these canvases from an important private collection of PNG and Pacific Art. Described as giants among the great artists of the 20th century, both Marc Chagall (French, 1887-1985) and Joan Miro (Spanish, 1893-1983) were also masters of their craft as print makers. While the two were very different in temperament and approach to their art, their lives spanned almost 100 years of the turbulent movements we now know as modern art. This exhibition brings together a tantalizing sample of their prolific output of works on paper. These works dance and sing and spin on the page; bursting in a riot of colour in some, in others, making a more subtle appeal to the senses. Cheryl Hannah, fYREGALLERY Director is delighted to present these lithographs in association with her long standing art advisor and mentor, Josef Lebovic. fYREGALLERY is committed to presenting emerging artists works on paper and bringing high quality international original works on paper to a new audience. HannahFyre Enterprises is proud to announce the opening of FyreGallery with new work by Suzanne Bellamy. Still Life Journeys explores the printed, painted and remembered surface to create works on paper, canvas and wood which intrigue and beguile. Very collectible, Suzanne’s works are a unique blend of abstracted and figurative images. The images unfold to engage the viewer in a discovery of their own responses to familiar objects while challenging their use of memories and imagination. Cheryl Hannah, FyreGallery Director is delighted to present Suzanne’s work. It is the first exhibition for this significant new art space in the Australian and international art community.